A year from now, the North West 200 will be marking its 90th year and what changes the event has seen in that time. From an era of daredevil, rough and ready riders turning up and taking off, the NW200 has been transformed over the past decade into a million pound event, attracting 80,000 spectators to the north coast every May. There have been spectacular races, dismal days of weather-interrupted meetings, tragic days of competitor deaths, wartime, Troubles-related and foot and mouth disease cancellations, the coming and going of various officials and sponsors, but the event has survived — and flourished. And the one constant has been the generations of legendary riders, from those who arrived with their bikes in the back of battered vans and trailers to the present day elite band of full-time professional riders with their state-of-the-art manufacturers’ bikes and motor homes with all mod cons. It is thanks to the skill and bravery of all those riders that the North West has become a world renowned event and a model for others. Under Race Director Mervyn Whyte and his Coleraine Club organising team, it has grown on an unimaginable scale from the first North West 200 on Saturday, April 12, 1929 and, like most Irish road races of the time, was principally a handicap event with riders — 31 in all — starting at intervals. Today, there are over 100 from 16 countries. Only eight finished in 1929 with Billy McCracken (348cc Velocette) taking the handicap win by seven minutes from Coleraine rider Malcolm McQuigg (250cc Zenith). A year later the handicap start was dropped and each class started en masse from Portmore Road, opposite the old golf links. In the 30s, the star names who competed at the North West included the legendary Stanley Woods, Jimmy Guthrie, Graham Walker (father of legendary F1 commentator Murray), Freddie Frith and Harold Daniell to name but a few. The outbreak of World War II meant the event did not run between 1940 and 1946 with Malcolm Templeton from Ballymena and Artie Bell among the race winners in 1947. Legend Geoff Duke made his North West debut in 1949 with the six-time World Champion winning three times at the Triangle, setting the first 90mph lap in 1951 on his way to winning the 500cc race on a Norton. Jack Brett from Leeds set the first 100mph lap in 1957 with a time of 6m 37secs on his 500cc Norton. Scottish hero Bob McIntyre, twice a World Championship runner-up, won four races around the then 11.045 mile circuit following his debut in 1953, setting the first 105mph lap in 1961. Two years later, the then North of Ireland Club organisers cancelled the event due to lack of entries and a clash with the FA Cup Final, the Coleraine Club then taking over to get the show back on the road. A race I remember is the 1968 250cc contest when 1965 50cc World Champion Ralph Bryans brought a 250cc six-cylinder Honda to the North West. Honda had pulled out of racing but loaned a machine for Ralph’s use, and he promptly led on the opening lap. However, on lap two the carburettors started to fall off and he slowed, holding them on with his hand until he got back to his pitstop. Repairs completed, he re-joined in about 10th position and set a blistering pace, smashing the lap record on the last lap at 109.23mph to finish fourth in a race won by Rod Gould. Remember the QUB 500cc Seeley? The Queen’s University machine, under the guidance of Professor Gordon Blair, made its first public appearance during practice for the 1969 North West in the hands of Brian Steenson, completing one lap at 102mph before a primary chain broke, putting it out of the race. The Troubles had a big affect on the North West 200 and in 1972 the event was cancelled on security advice with a grass track meeting staged instead. Back for 1973, the event had its first major change, with racing along Portstewart Promenade no longer acceptable. Competitors then turned left at York Corner via Cromore Halt (Station Corner) to Shell Hill Bridge. In 1973, Tom Steele was clerk of the course and Billy Nutt race secretary, with the event gaining National status and, for the one and only time, counting towards the Ulster Road Racing Championships. That year also saw the only ever 200cc race at the North West, won by Kells rider Jackie Robinson. History was created in 1974 when John Williams became the first rider to complete a hat-trick of wins on a course that turned left at Glenvale, re-joining the circuit at Church Corner having not used the Metropole section between 1968 and 1974. The 70s, the decade of Mick Grant, and the Green Meanies (Kawasakis) took the lap record to 120mph in 1975 with our own star Tom Herron becoming the fastest rider on a UK circuit in 1978 with a lap of 127.63mph before his rear tyre started to disintegrate. Tragically, Tom lost his life in an accident at Juniper Hill in 1979. Tony Rutter and Ray McCullough were adjudged to have dead heated in the 1977 350cc race. Five-time F1 World Champion William Joseph Dunlop made his debut at the North West in 1974, going on to take 13 wins in his illustrious career. His brother Robert took to the North West for the first time in 1984 and raced to a record 15 wins between 1986 and 2006. Robert tragically lost his life in a practice accident ahead of the 2008 North West 200. In 1980, the Shell Hill Bridge section was omitted from the circuit with riders now turning left at University Corner and up the Link Road to Ballysally Roundabout, taking the opposite way around to normal traffic. Keith Huewen — now BT Sport MotoGP commentator — set the first 125mph lap of this circuit when winning the 1980 Superbike class on a 750cc Yamaha. 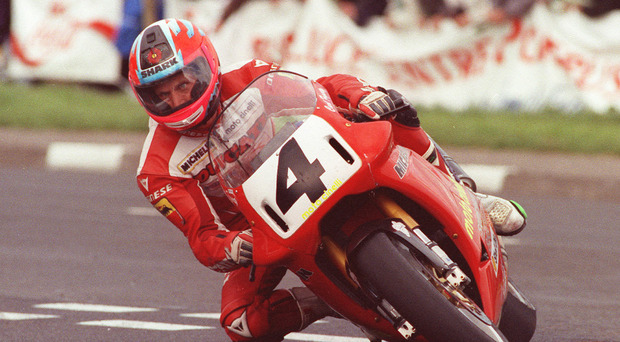 Into the 90s and eight-time World Champion Carl Fogarty fulfilled an ambition in 1993 when, after some near misses, he won two North West 200 races on his Moto Cinelli Ducati with a new lap record. Who will ever forget that memorable day in 1992 when Phillip McCallen won a record five — yes, five — races in blistering sunshine only to slip off at University Corner in the second 250cc race when chasing his sixth victory. How do you define the ‘noughties’? Flying Kiwi Bruce Anstey was a debutant winner in 2002, while Michael Rutter has scored 14 wins — it should have been more — since his 1992 debut, the 46-year-old still racing competitively today. William Dunlop’s debut was in 2003 and he has four wins to his name. William’s younger brother Michael began his North West adventures in 2006 and has one more victory than his sibling, with his 2008 250cc victory less than 48 hours after his father Robert’s death remaining arguably the best North West 200 race triumph ever. It was certainly the most emotional with spectators in the grandstands rising as one to acclaim what the then 19-year-old had achieved — grown men cried as Michael was overcome with emotion. A never to be forgotten day in the history of this great event. The all-time wins record of 15 by Robert Dunlop was equalled by Alastair Seeley in 2015 and the ‘Wee Wizard’ has now extended that to 22 victories and counting. That brings us to last year and the epic final Superbike encounter that saw Glenn Irwin, Seeley and Ian Hutchinson put on an absolute thriller before Irwin clinched his first ever North West 200 victory. Will a new name enter the history books today? That’s been the beauty of the North West 200 for 89 years — the thrill, anticipation and absolute guarantee of a spectacle, whoever takes the chequered flag.